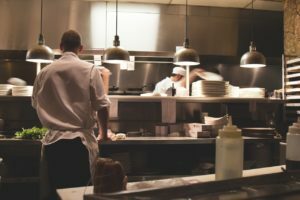 Tips For Choosing Uniforms For Your Restaurant | Ace Uniform Services, Inc. Contact Ace Uniform for your restaurant uniform needs! Are you a restaurant owner? It is crucial that you give careful thought and consideration into your staff’s uniforms. They are important to the success of your business in many ways. If you need help deciding on uniforms, keep reading for a few helpful tips! It is important that your staff’s attire has the restaurants name on it somewhere. This should also assist your marketing efforts too. In addition to text, you may want to include graphics and possibly even your slogan. There are many routes you can take regarding the style of your restaurant uniforms. You must ensure that the uniform attire is in line with the overall style of your restaurant. For instance, if you own a formal restaurant, you may go to go with button-down shirts and slacks for your staff. In casual restaurants, it is more fitting to opt for tee shirts and khakis. When deciding on uniforms, it is important to consider the jobs of your staff. If an employee works in the kitchen, you want to provide them with a few aprons to help keep their shirt underneath clean. Also, if they are going to be working near hot surfaces, you want to avoid long sleeves and choose clothes that are fitted. It is a good idea to involve your employees when deciding on your restaurant’s uniforms. They may be able to provide you with some helpful feedback. Your employees may even make suggestions of ideas you haven’t even considered. Since your employees are going to be wearing their uniforms for several hours a day, you want to make sure that they are comfortable in them. If you are going to leave your employees responsible for taking care of their uniforms, you should choose fabrics that are easy to maintain. In other words, ones that don’t fade, wrinkle and are easy to wash. This entry was posted on Friday, August 10th, 2018	at 11:26 am	. You can follow any responses to this entry through the RSS 2.0	feed. Both comments and pings are currently closed.